Product #17546 | SKU BOTTLE ROCKET STAGE 1 | 0.0 (no ratings yet) Thanks for your rating! The Bottle Rocket Stage 1 Microphone from Blue is designed to capture vocals and instruments with professional grade detail and flexibility. It offers a transformerless, solid-state output stage that ensures minimal noise, crisp detail, and clarity. 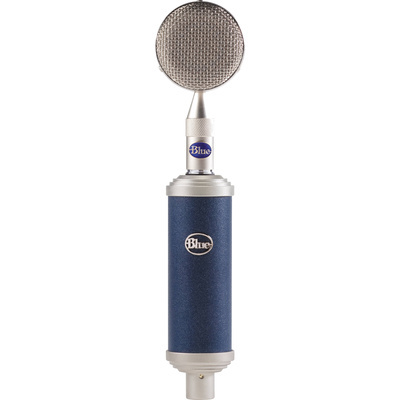 This solid-state condenser microphone also features the Blue Bottle's bayonet-mounted, interchangeable Bottle-Cap system for maximum versatility and control. The included B8 Bottle-Cap is designed as an all-purpose capsule for accurately capturing both vocals and instruments. The Bottle Rocket Stage 1 is compatible with additional Bottle-Cap capsules for various polar patterns, frequencies, and sensitivity characteristics. The package includes a wooden storage box and a shockmount.